Throughout each semester, we at the MIT International Students Office have always traditionally highlighted a few holiday celebrations around the globe; this past academic year, we partnered with student groups on campus for the first time. 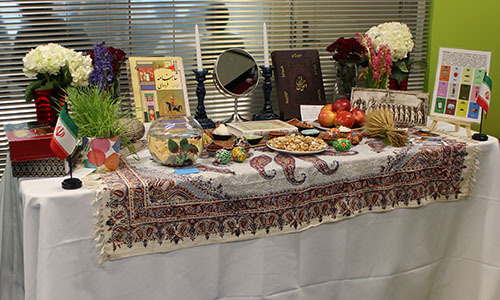 On March 22 the Persian Student Association (PSA) collaborated with the ISO to bring the Persian New Year celebration to our office, including a traditional table beautifully decorated with various items, each symbolizing something different. For example, the mirror signified light, and a fish represented life (we adopted the fish for our office pet). We also enjoyed traditional foods from the Persian restaurant Roksana. Happy Nowruz! 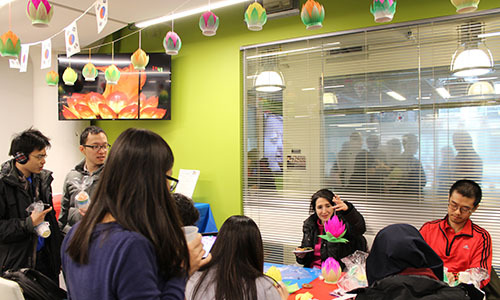 The Korean Graduate Students Association (KGSA) partnered with the ISO on April 10 to bring the MIT community the Korean Lotus Lantern Festival, also known as YeonDeungHoe. The New England Korean Buddhist’s Association provided handmade lotus lanterns to decorate the office and donated some DIY kits to create your own lantern. Typical dishes from Coreano’s was served, while images of the Lotus Lantern Festival in South Korea were displayed along with traditional music.